Alfa Romeo‘s assortment of non-SUV offerings are impressive in their own way, leading to quite the predicament for a consumer who has been targeting the brand’s vehicles. Each of the cars provide their own specific capabilities and amenities, and these attributes certainly influence which type of customers these cars actually appeal to. Consumers generally relate luxury cars with sportiness, and that connection certainly applies to the 2017 Alfa Romeo Giulia. Despite being a relatively small vehicle, the accompanying engine is capable of delivering a whole lot of power. The 2.0-liter I4 Intercooled Turbo Engine is able to crank out an incredible 280 horsepower and 306 pounds-feet of torque, resulting in an astonishing 149 mile per hour top speed. These specs also play a significant role in the vehicle’s acceleration capabilities, as the Alfa Romeo Giulia can get up to 60 miles per hour in 5.1 seconds. To accommodate all of that power, the engineers specifically designed the Alfa Romeo Giulia to be sporty and efficient. The sculpted lines, central shield, and air-intake valves aren’t purely for show; rather, these stylistic decisions also positively influence the vehicle’s aerodynamics. Of course, considering all of the power that’s lingering under the vehicle’s hood, drivers are going to want some kind of assurance that they’ll remain safe when operating the car. That shouldn’t be a concern when you’re traveling in the 2017 Alfa Romeo Giulia, as the vehicle provides its customers with an array of safety functions. For instance, the Integrated Brake System makes decelerating and stopping a lot more intuitive and driver-friendly. The accompanying Forward Collision Warning Plus system can anticipate an impending crash and alert the driver via audible and visual cues. The unit can even adjust the brakes if necessary, reducing the chance of a crash in the process. There’s even a Standard Backup Camera with Rear Park Sensors to reduce the likelihood of an accidental collision. In other words, owners shouldn’t be worried about a collision when they’re operating the 2017 Alfa Romeo Giulia. Predictably, the upgraded 2017 Alfa Romeo Giulia Quadrifoglio takes those power specs to another level. The all-aluminum direct-injected 90-degree 2.9-liter V6 Twin-Turbo engine pushes out an impressive 443 pounds-feet of torque and an unmatched 505 horsepower. These numbers have an incredible influence on the vehicle’s accompanying power specs, as the Giulia Quadrifoglio can reach a top speed of 191 miles per hour and a 0-to-60 miles per hour time of 3.8 seconds. Plus, thanks to the brand’s decision to include features like a cylinder deactivation system and a start/stop system, drivers will find that efficiency is maximized, thus saving them a chunk of money at the gas pump. Of course, if a driver truly wants the ideal driving experience, they’ll presumably require some assortment of interior amenities. 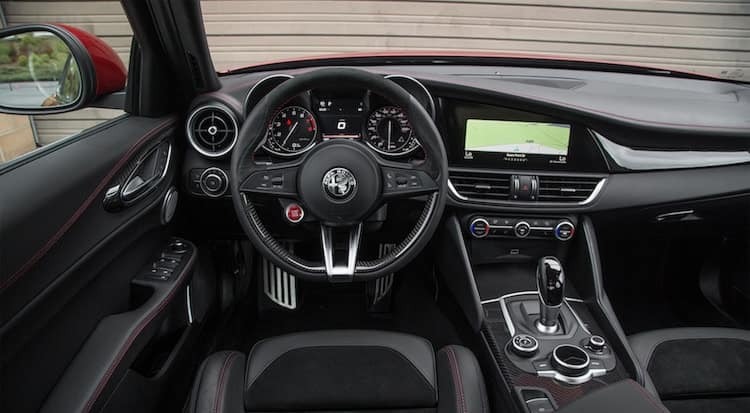 Well, those features are certainly included in the 2017 Alfa Romeo Giulia Quadrifoglio, as the vehicle is chock full of inclusions that influence entertainment, comfort, and convenience. The vehicle’s touchscreen system provides easy access to a number of useful applications, and the available 900-watt Harman Kardon surround sound system, which includes 14 speakers (including a pair of surround sound speakers), a subwoofer, 12-channel configuration, and high-speed amplifier, will distract you from your boring commute. Meanwhile, your occupants will surely be impressed by the premium leather and Alcantara upholsteries included throughout the cabin, and they’ll also be impressed by the carbon fiber and aluminum inclusions and the expert stitching. If you’re seeking a vehicle that delivers the perfect combination of power and luxury, then there might not be a better target in the entire industry than the 2017 4C Coupe. The turbocharged direct injection vehicle (with an accompanying Alfa Romeo TCT Twin Clutch transmission) pumps out a commendable 237 horsepower and 258 pounds-feet of torque. The accompanying speed specs are just as impressive at 160 miles per hour and a 4.1-second 0-to-60 time. Meanwhile, the inclusion of a sport suspension, revamped brake discs, and Brembo calipers will make for one of the smoothest commutes in the segment. The vehicle also includes the brand’s DNA System (with Race Mode), allowing drivers to choose the driving mode that caters to the road conditions. The system includes the Dynamic, Natural, All-Weather and Race mode, means owners can pick the configuration that best fits their needs. Now that you’ve taken in all of this relevant information, it’s time to begin shopping for your targeted Alfa Romeo. Well, if you live in the Albany, New York area, Alfa Romeo of Albany is the perfect place to make that purchase. The dealership provides some of the most competitive prices in the area, and their helpful staff will see that you drive off the lot in your new Alfa Romeo in no time.